We’ve been making this midweek meal for a long time. It never disappoints. 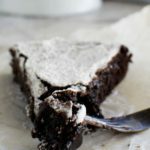 Just tip six ingredients into a baking dish… and bake! Scroll to the end of the post to watch my quick how-to video. 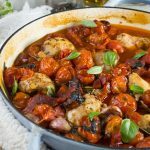 One pan baked chicken with chorizo and tomatoes is on regular rotation at our house, whatever the season. It’s definitely one of those recipes I’m wondering why I haven’t shared already. And in fact Mr. Scrummy has been nagging me to post it for months (possibly even more than a year – ooops, poor Mr. Scrummy!). So why haven’t I until now? Well, mostly it’s because I’ve always seen this particular meal as Mr. Scrummy’s domain. He often asks if I’d like him to cook, cool and helpful husband that he is, and many times he serves this. Which means one important thing, of course… it’s been perfected over many, many ‘makes’. We really hope you come to love this simple recipe as much as we do, and make it time and time again. It’s a lot more delicious than the sum of its parts, with only five main ingredients. 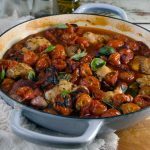 Quite simply, oodles of flavour oozes from the generous amounts of chorizo, garlic and basil dumped into the dish. Really, nothing else is needed – just a pile of toasted, olive-oiled bread or creamy mashed potatoes to eat alongside it. This is a true one-dish meal. Throw everything into the baking dish – don’t even peel the garlic cloves (squeeze that roasted deliciousness into the food on your plate instead!) 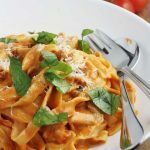 – and the massive amounts of small tomatoes will melt over the chicken and other flavours, leaving you with a beautifully tasty sauce. Talking of the tomatoes… you might be a bit shocked by how many you’re tipping into the dish, but don’t worry, you haven’t weighed them out wrongly. They’ll bake down to just the right amount. Here in the UK punnets of cherry tomatoes are fairly cheap, but to be honest with you you could use any kind of tomatoes in this dish. If bigger tomatoes happen to be on sale where you are, just chop them into smaller chunks and toss them in. The most work you have to do for this recipe is peeling and chopping the chorizo. 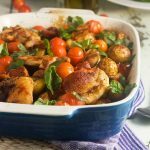 The chicken thighs, garlic cloves and cherry tomatoes go in as they are, making dinner the night you make this as easy as you can imagine. I’m on a bit of a roll with my videos this month, so I decided to make you one for this recipe, even though it’s possibly one of the easiest dinner recipes on the blog so far! Let’s just say it’s to prove to you JUST how easy it is. 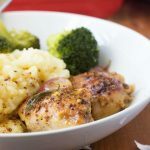 The simplest of baked chicken meals, but also one of the tastiest. Just pile tomatoes, chorizo, garlic, basil and olive oil into a baking dish and bake until browned and bubbling. Delicious! Pre-heat the oven to 180C / 355F. Place the chicken thighs in a large baking dish. Scatter the garlic cloves in between/over them, then grind over a generous amount of salt and pepper. Scatter the chorizo pieces over the chicken, followed by the basil and then the tomatoes. 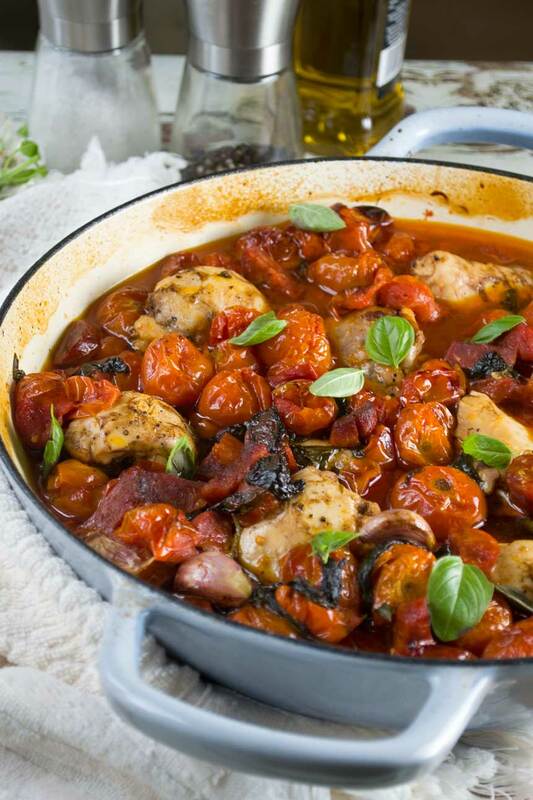 Drizzle over the olive oil and balsamic vinegar (if using), then bake for 50 minutes until the tomatoes are slightly charred and bubbling and the chicken is cooked through and slightly browned where it pokes through the sauce (toss and stir once half way through cooking). Serve in dishes with the toasted bread or over mashed potatoes, as you choose. Feel free to use skin-in, bone-in chicken thighs and/or legs in this recipe instead, if you prefer. Just cook for 10 minutes longer if you use this option. I leave the garlic unpeeled so it roasts in the skins – perfect for squeezing out into the tomato-ey sauce! You can peel the garlic though if you prefer. 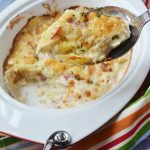 This makes great leftovers! Simply serve into dishes, cover and reheat in a microwave for about 4.5 minutes. You definitely need the crusty bread, Janette! 2. Can we make this in a cast-iron casserolle? Hi! So sorry for the late reply… I hope you still made this and it turned out OK! For next time, though… don’t cover in the oven, just keep an eye on it and stir about half way through (you want the tomatoes to be almost slightly charred on top). 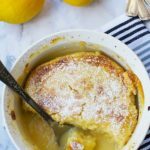 You can DEFINITEY make it in a cast iron casserole – that’s how I make mine 🙂 Good luck! This dish looks awesome Helen! Love the video, too! Love chorizo and can’t wait to try it! Oodles of flavor? Sold! I’m so glad Mr. Scrummy got you to post this recipe…. even if it did take a little while to get out there (no worries, I have several of those too). 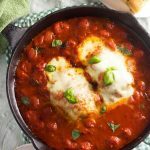 I love how quick and easy this is to make – so perfect for a delicious and hardy weeknight meal. And I love the video too! Thanks, Kathleen! At least we had lots of time to perfect the recipe! J’aime beaucoup tes vidéos Helen, c’est incroyable comment ça pareil encore plus simple! Une belle recette qui donne très envie de la goûter! Merci, Eva! Je suis tres heureuse d’avoir fait la recette encore plus simple! Please excuse my ignorance. It says Chorizo, but there are several kinds of Chorizo. Did you use use beef, pork, or something else. Plan to make it tomorrow, so I bought both kinds. Hi Margaret! We like to use classic Spanish chorizo – the one you buy in a big long sausage and peel the skin off before using. I think it’s made of pork (?). To be honest though I don’t think it matters too much which chorizo you use – any will give the dish a lovely flavour. I hope you enjoy it! Thank you for your reply. I will use the pork. Wednesday nights are family dinner nights, so I like to come up with something different each week. No problem, Margaret. That’s a really good idea – I like it! Well I really hope this doesn’t disappoint! Hello Emma! I really don’t see why you couldn’t try this in a crockpot. I’d just make sure to use skinless boneless thighs and possibly not as many tomatoes because there’s always more liquid in a slow cooker. I can’t guarantee it as I haven’t tried it this way, but I have a feeling it would still be delicious. I’m not sure there’s too much that could go wrong (famous last words!). Please do let me know if you do give it a go! Everyone said I had made to much, funny really nothing left and everyone wanting more!!! Fantastic meal. Hi Jim, thank you so much for taking the time to leave your feedback. I always appreciate it – especially when it’s good news! I’m so glad you proved everyone wrong and they enjoyed the meal so much! This is still one of our go-to midweek meals. We love it! Hi Richard! Thanks so much for taking the time to pop back and leave your review. I’m really interested to hear that you made it in the slow cooker! 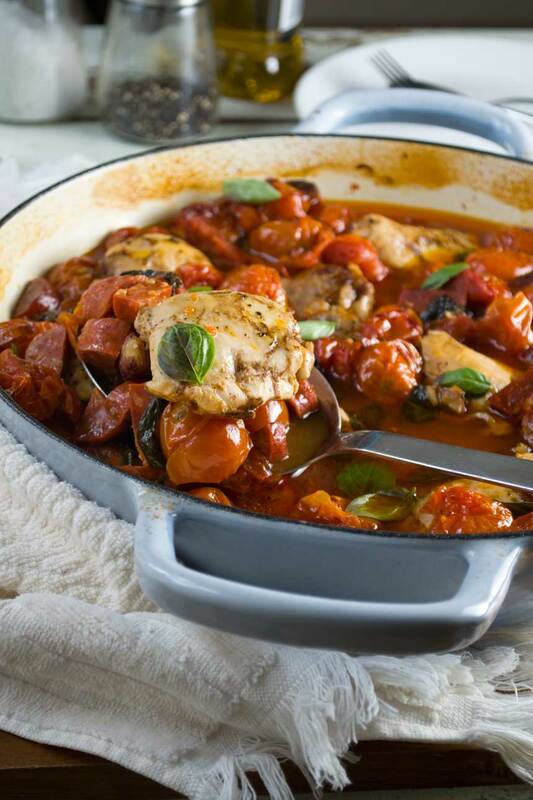 I’ve never tried this because I like the way the chicken and tomatoes go a bit sticky and brown in the oven. 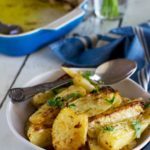 I’d be interested to see if you prefer it this way or in the slow cooker – or if it makes no difference to you! In any case, so glad you enjoyed it. It’s been one of our go-to meals for literally years! Hi Kevan! So happy the family liked this one. It’s ever popular in our house too. Pretty much the recipe we have made the most for the longest length of time. It feeds us for 2 days too, so that’s another bonus. Thanks so much for leaving a review! 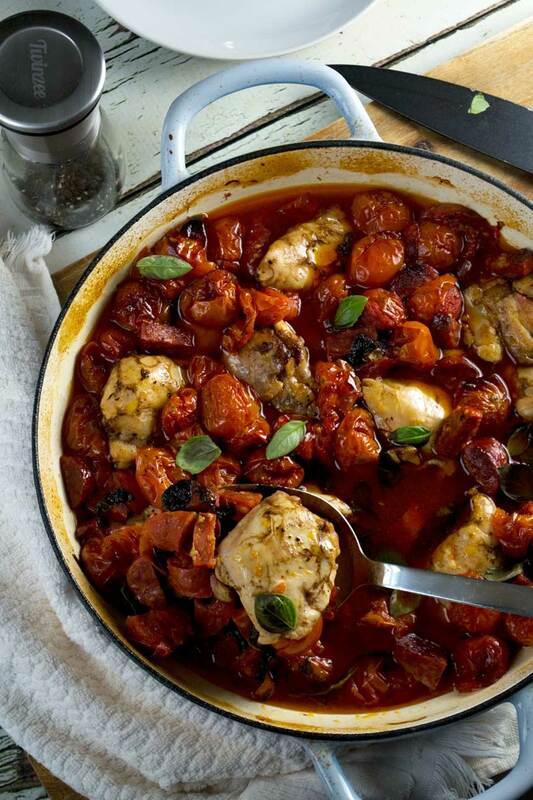 Thank you, I’ve just made your baked chicken with chorizo and tomatoes. It’s extremely easy and delicious. I didn’t have any cherry tomatoes so I just poured in a tin of peeled tomatoes. and it was quite delicious, although with fresh I can imagine that it would be better. 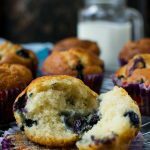 I am now on my own and need recipes like this because after 50 years it’s difficult to reduce quantities sufficiently so freezing what’s left works for me. Hi Arthur! Thank you so much for taking the time to leave your review. I’m so glad you found this recipe useful! We’ve been making it for literally years now and always have some left over for the freezer (or the next few night’s dinner!). Definitely try it again with the cherry tomatoes (at least 3 or 4 punnets!). I think you’ll notice the difference. But it’s great to know that this still turns out well if you use canned tomatoes! Hi, do you need to add any liquid to the recipe or does the sauce just come from the tomatoes? Hi Dave! No, the cherry tomatoes kind of melt down in the oven and make a delicious sauce! Helen, gonna try this tonight but with tinned tomatoes and a little tomato paste and dried basil. Just a thought; would it be OK with pork mince seasoned with sage and made into meatballs? Hi Kevin! I suppose you either tried this or didn’t by now? I’m not sure if it would work as well with tinned tomatoes, but you never know. Did you try it? I like the sound of the pork meatballs!